I saw this Sporting News article today on Redleg Nation, who are starting to beat the drum to make Joey Votto the next captain of the Cincinnati Reds. While I think it might yet be too early to bestow such an honor–the last one was Barry Larkin–it does strike me as an inevitabile choice at this point. Of course, that’s not what this little post is about. This post is about other ways Votto demonstrates his extraordinary awesomeness. Votto hired a private instructor this past offseason and took up to five hour-long classes a week during the winter He hasn’t had time for all the classes since the season started, but he still spends part of nearly every day studying Spanish. He conjugates verbs, works with the Rosetta Stone program and recently has made a point of hanging with Latin teammates during pregame stretches. That is just so awesome. For most people outside of the US, learning another language isn’t an uncommon thing. Here, it often feels like an almost impossible accomplishment. Of course, that could be because the only place to practice in much of the US is in schools and classrooms. But Votto has the perfect immersive environment. And he’s taking advantage of it, much like a certain other career Red did. Damn straight. This also means that someone on the team besides the trainer or Dusty Baker will be able to talk to the Spanish-speaking pitchers, including Johnny Cueto and Aroldis Chapman. 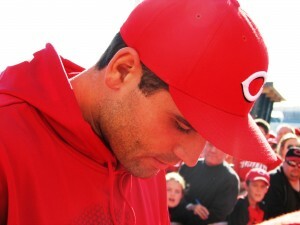 Votto is so intent on improving all areas of his game that it’s even extending to learning Spanish. Just when I thought I couldn’t like him any more. I certainly hope Jay Bruce is paying attention.